Not since Under the Tuscan Sun have I read a book that has made me want to cook, travel, and eat every simple Italian dish in sight. 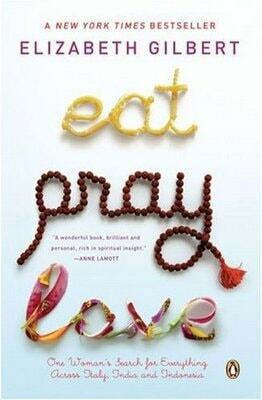 That is, until I picked up Eat, Pray, Love the other day at the bookstore. I’ll be honest, I want to see the movie, it actually looks good. Plus, I do really like Julia Roberts, and the fact that I want to see the movie is the main reason I chose the book (I’d like to read it before watching it). But so far the book is proving to be very good, especially the first third, which mainly takes place in Italy where Liz eats delicious Italian food ALL THE TIME. Makes me want to run out and grab a crusty baguette and dip into a state of olive-oil-herb-bliss. It’s a wonder I still bought the damn book! And there you have it. I felt a little better about her opinion on my newly purchased novel. I’m loving it so far, and I’m pretty sure I’ll love it all the way through “Pray” AND “Love.” Especially if there’s more food involved! Oh! I picked this book up the other day and almost bought it. Now I regret putting it down! Nice blog! You have a new follower! LOL – well, maybe you’ll have to pick it up again. 🙂 Maybe I’ll blog about a Part II once I finish the entire book. Shouldn’t take long; it’s a quick read. I LOVED the book… Um, I still have the last part to finish, but I thought the stuff in India was really good. Not a juicy ( sorry for the pun) as the Italy food stuff, but really inspiring. CK – thanks! I’m following your blog & on Twitter too. Just started Dave Ramsey in April, so all your budget/coupon/deal amazingness will definitely help!